Navigate to Themes > Active Theme from your admin console. On the left side, select either Order Invoice or Order Packing Slip depending on which you wish to edit. Once selected you can click on widgets in the left column. Here there are widget areas where you can add a piece of text to the invoice/packing slip using the custom html widget. 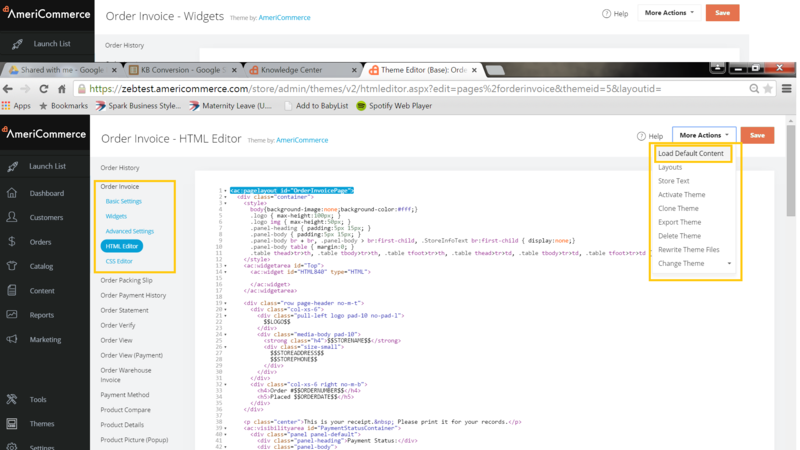 For more advanced editing, click HTML Editor instead of widgets in the left column. This will give you the full layout of the page. If it is blank, click the Load Default Content at the top. The page will refresh with the default HTML. You can add, edit, rearrange, or remove html from this page to achieve the layout your would like. Once finished with your changes in the HTML Editor, click Save in the top right. How can I see what I am doing, as all is coming up in the live design is "ORDER ID was not specified"?